What is behind your choice of this piece of art in response to the Syrian Refugee Crisis? Artist Sarah Van Sanden: The delicate airborne seed sketched on a found envelope embodies, for me, movement, transition, and possibility—a metaphor of sorts for the people fleeing unlivable circumstances in Syria. Despite the murky darkness in the drawing, there’s a burst of light coming from the seed that speaks of hope, endurance and what waits in limbo to thrive in a new place. Why did this piece of art resonate for you or seem like it would give you an avenue into writing about the Syrian Refugee Crisis? Poet Tiffany Higgins: Sarah and I each responded independently to the source material, the crisis itself. I’d read about the Syrian war and refugee crisis for some time with pain and not a few tears. Then in Sept. 2015, I read the headline of the article, “Doomsday Vault Opened,” which described that this international seed vault in Svalbard, Norway, was being opened for the first time, unexpectedly, because Syrians needed some of the seed samples to grow crops. The absurd irony for me underlined the insoluble tragedy, a truly planetary crisis. I watched a video of the ICARDA (International Gene Bank) seed bank director, Dr. Mahmoud Solh, describing their heroic, ongoing efforts to safeguard the seeds in the Syrian War. His quiet dignity and integrity moved me so much; so much was said in what he didn’t say. 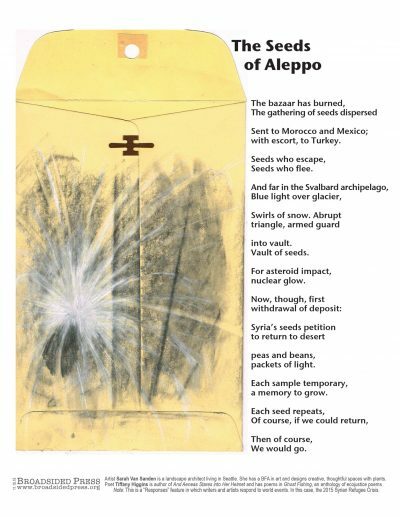 The phrase “The Seeds of Aleppo” came to me, and I hope the poem in some way reflects this dignity I heard. Sarah’s art, “Seed on Envelope,” with that bursting, radiating bright movement on the dusty envelope, evokes the dual qualities of this sudden diaspora, at once cataclysmic and generative, the unexpected movement of seeds. Poet Tiffany Higgins: I have sincere, ongoing questions about how to effectively represent others’ suffering. Poets I esteem such as Camille Dungy and Kyle Dargan have warned against adopting others’ voices as one’s own, and I heed that warning. I’ve heard poet Tim Seibles advise: “You’re probably going to get it wrong. But keep trying.” A pitfall is to portray that one knows more than one knows, to claim knowledge one doesn’t own. And yet paradoxically, to extend one’s empathy to imagine into another’s experience—isn’t that the core act of human connection? We must imagine beyond our edges. I keep a few rules of thumb: Try not to lecture or hector. Resist the tendency to give a pile of information: travel together into mystery. Pathos is okay, but let more happen. Be complicit in it: include awkward me. Not description but being. In rubble of realism, dig up the existential nub. Among documents, let rise a ceremony of transformation. Research: prepare, prepare—read lots of stories from many perspectives—cry—and wait for lightning to strike, that aesthetic angle that is the entry into a strange, imperfect communion. Artist Sarah Van Sanden lives in Seattle, where she takes every opportunity to relish in urban nature. She has studied visual art, botany and design and makes her living designing and building landscapes.